You may have seen the graphs, maps and diagrams saying how much solar potential we have in Western Canada, yet places like Germany are still so far ahead of us. If we have so much more sun, why would we not install as much solar as we possibly can? The answer lies primarily in 1) government incentives and 2) electricity price. The electricity price is set by the utility companies and in South-central British Columbia, solar has a particularly more difficult time competing because of new BC net metering regulations recently imposed by Fortis BC who is the wire service provider for the area shown below. 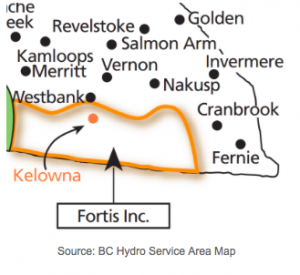 The way Fortis BC runs their BC net metering program is that you are given credit on a monthly basis for any net-positive generation you may have. In the summer, you’ll be gaining credit and in the winter you can use it up. At the end of the year, if you have excess credits, Fortis writes you a check for the outstanding balance at a particular rate. The Fortis BC net metering program sounds like a decent system except for two new regulations which devalue the distributed generation which solar provides. First, Fortis BC has put a cap on the amount of solar you can install such that you won’t be approved for the BC net metering program if your projected annual generation is more than your past annual consumption. Second, Fortis BC announced that, if you do manage to generate net-positive at year’s end, you will be paid out at the same rate they pay the utility-scale electricity producers such as hydro dams or natural gas turbines. This means you’ll be buying electricity at 10-15 cents/kWh and selling it at only 4.5 cents/kWh. These regulations on the Fortis BC net metering program don’t allow for the transition to a renewable grid and do not capture the value of distributed generation. The wire service provider is responsible for getting the electricity from the source to the consumer which, in the case of utility-scale generators, is a long distance and requires large transmission lines and transformers. But for net-metering customers, the power is being generated much closer to the consumers and requires very little investment from the wire service provider. If your generation exceeds your consumption, the electricity will go to your neighbours via the lines already in place. Hopefully, we will see a transition in the future to capture the full value of renewable energy and empower the consumer to assist in the transition to a sustainable future.